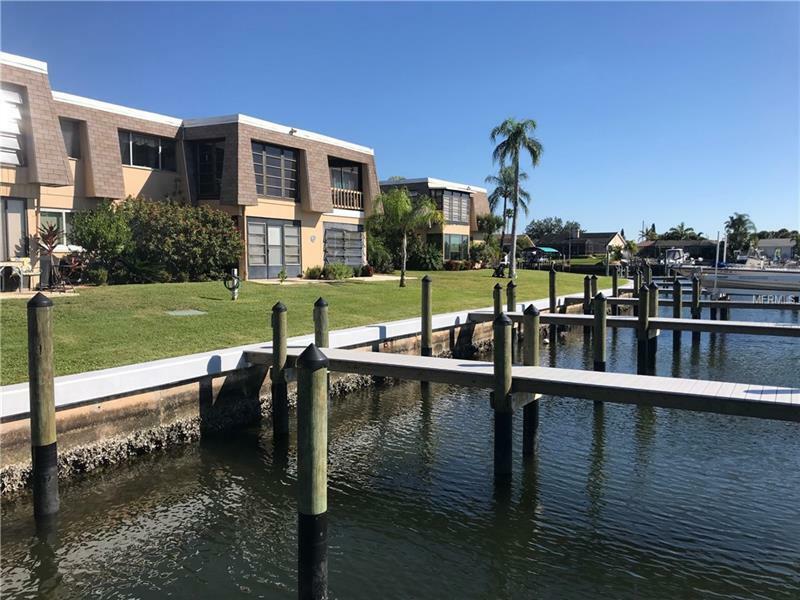 Gorgeous, fully furnished, totally remodeled condo in 55+ waterfront community with a private brand new deep water boat slip! Run donât walk! In just minutes you can be out enjoying the open Gulf or waterfront dinning-Florida living at its finest. This condo has a ton of natural light from the oversized windows in every room, and donât worry about Sunny Florida days as they have heat reducing UV film, sun shades and plantation shutters! This quiet end unit has a scenic view of the community heated pool. The updated kitchen is very impressive with designer backsplash, soft closing doors and top of the line stainless steel appliances. Wine connoisseur? Included is a built in matching wine cooler, cheers!!! For your car is a covered reserved carport, located just a few steps from this perfect residence. Just bring your toothbrush car & boat and move right in! The furniture is upscale & the ambiance of the unit is definitely sophisticated & chic - the only thing not expensive is the price! Did I mention âRun Donât Walkâ? Water Body Name: TAMPA BAY!